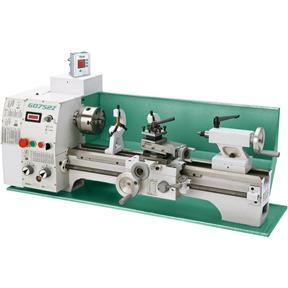 The Model G0752Z is a variable-speed version of our G0602 10" x 22" Bench Lathe. 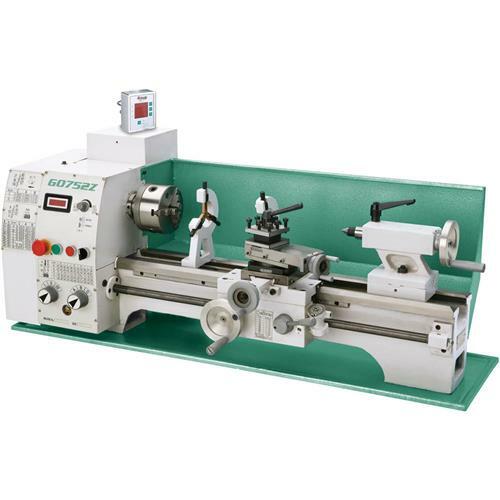 It shares the same features and accessories as the G0602, but is equipped with a digital RPM display on the headstock, and is identical to our G0752 lathe except it sports a 2-axis DRO included. 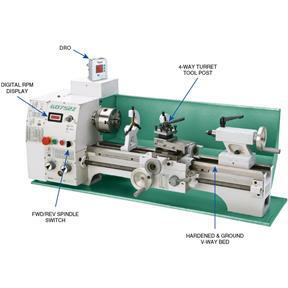 It also has electronic variable-speed spindle control, which allows you to change spindle speeds with the simple turn of a dial—and while the lathe is still running! This feature eliminates the additional time it takes to stop the motor and then change gears or move levers around when changing spindle speeds. Even better, the fine degree of control allows you to set the optimum spindle speed for your feed speed and workpiece material, so that you can get the best finishes possible. This lathe arrived a few weeks ago, and as a weekend hobbiest I haven't had time to really get everything cleaned up and functional. I purchased this lathe knowing a smaller import mill like this one would likely need some work to really make a useful tool. My feeling is that going through everything in detail is the best way to get to know a new tool like this. This is truly a benchtop lathe, one size up from a mini-lathe but not a full-sized lathe by any means. The DRO and variable speed are "bells and whistles", neat features, but not the core of a lathe. I look on this lathe as a complete kit, sort of the "heathkit" of lathes, a build your own project that has all the features already included in the kit. The only "feature" really missing is that this lathe won't turn left hand thread. I considered that before ordering and opted for this lathe, while a bigger lathe would solve that it wasn't in my budget for a 'beginner' lathe. The tailstock slides cleaning on the bed, and the ways are clean and smooth. I'm making my own bench so I haven't checked for accuracy yet. The four way tool post included with this lathe is probably the biggest flaw. It looks like a grade school shop project, or like it was milled using a worn out drill bit. As is, I can't believe it would hold anything solidly without risking a lot of chatter. I had already decided on a quick change tool post, going with one of the better made imports, so this wasn't much of an issue for me, but anyone trying to use the provided tool post would be frustrated. The compound and cross slide were both fairly stiff. I've dissassembled them completely and am in the process of rebuilding them. They are nicely polished (surface ground) on the outside. It would be more useful if they had surface ground the interior dovetails. Upon dissassembly the cross-slide appears to have sat in a stockpile for a while, long enough to have picked up rust and some pretty bad surface pitting internally from that rust. I had expected to have to polish them a bit, but looks like I will need to resort to milling the contact faces of the dovetails. While not insurmountable, this was not impressive at all. I may follow up with pictures, don't have any in hand at the time Grizzly sent me the email for this review. The small toolkit that comes with the lathe is useful to have everything needed in one place, but I'll upgrade the wrenches. I already ordered a live center to go with the tailstock (it came with several dead centers but not a live center). It comes with a faceplate as well as the three and four jaw chucks. I'll need to get a dog and a few fittings to turn between centers. The gear set for the threading gears are metal and appear well machined. I haven't opened up the headstock or the saddle yet. My intention is to get the crossslide and compound tuned up and see how well it works from there. Once I get those tight and smooth, I'll test it out and maybe report back on whether the VS is a good option. My thought was that it would be nice to tweak RPM without stopping the machine to get good finishes and/or chip breaking without having to fully stop and restart to do a gear shift. I can't yet report on the tradeoff against full HP/torque of running the motor at a fixed RPM and gearing it. Ordered this in Dec. of 2017. Received it in August of 2018. Then had to pay extra for tariff. Not happy about that, but the lathe is excellent. No issues. I would recommend the lathe. Quality appears to be excellent. Good alternative to buying a 40 year old South Bend. Have a basement shop. Size and weight are manageable. both an "A". Thank You, John S PS, I am an experienced machinist.